Meteor House » Philip José Farmer and the Pulps! Philip José Farmer had a life-long love affair with the pulps he read in his youth. They influenced nearly everything he wrote, but in the 1970s he paid special tribute to them with several stories. 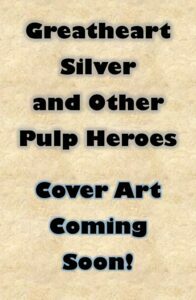 Greatheart Silver and Other Pulp Heroes collects these stories for the first time in hardcover! This collection also features an introduction by college professor and pulp historian, Garyn G. Roberts, Ph.D., and artwork (coming soon) by Keith Howell! The first three stories: “Greatheart Silver,” “The Return of Greatheart Silver,” and “Greatheart Silver in the First Command,” originally appeared in Byron Priess’ Weird Heroes series and have been collected before in the paperback, Greatheart Silver. These stories are Philip José Farmer at his most irreverent. The next two items, “The Grant Robeson Papers,” and “Savage Shadow” also appeared in Weird Heroes, and set up a fantastic premise that was never fulfilled and will leave you wanting more. The final story, “Skinburn” appeared in the Magazine of Fantasy & Science Fiction and is the most scifi of these stories, while still giving a nod to the pulps. Here’s something new—based on your feedback and buying trends, we’re only releasing this book in hardcover. Greatheart Silver and Other Pulp Heroes will debut at FarmerCon XIV this coming August, but if you preorder the book now, we’re offering an “Early Bird Special” discount of $5 off! So you only $27 + shipping for this fascinating collection of Farmer paying homage to many of his literary heroes! Please choose the correcting shipping option when preordering your copy.